OAKLAND (09-10-12) A 6-yard touchdown pass and five field goals was all the San Diego Chargers (1-0) needed to knock off the Oakland Raiders (0-1) in the season opener. 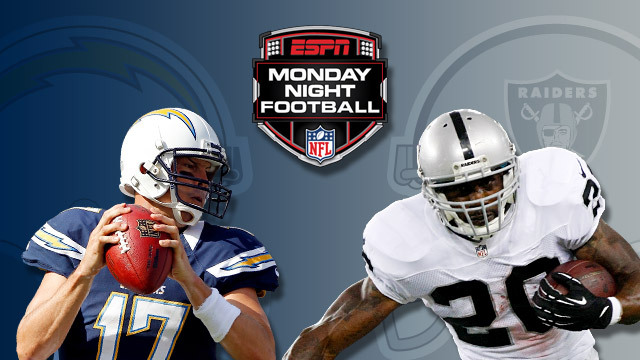 The Chargers have now won 15 of their last 18 games against the Raiders. They will meet again at Qualcomm Stadium on December 30th in the last game of the regular season. In the second quarter the Raiders lost their long snapper Jon Condo to a head injury after catching a knee from one of his teammates. The result would be two botched snaps and a punt blocked by Chargers tight end Dante Rosario in the second half. The Raiders rookie linebacker started in the first game of his NFL career. He recorded a total of nine tackles (7 solo & 2 for losses). Completed 24 out of 33 passes for 231 yards and a touchdown. Caught four passes for 66 yards and a touchdown. Forced the game’s only turnover in the first quarter and recovered an onside kick late in the fourth that clinched the game. Held Raiders RB Darren McFadden to only 32 yards on 15 carries. McFadden ended up being the Raiders leading receiver with 13 catches (career high) for 86 yards. The Chargers open their home schedule this Sunday against the Tennessee Titans (0-1). The Titans are coming off a 34-13 home loss to the New England Patriots.